Description: the Spinosaurus stands in a walking posture, with its left leg posed forward and the left arm raised, its mouth opened as if roaring and the end of the tail bent pointing to the right. It sports a mostly tan or beige paint job, which covers practically the entire underside of the figure, except for the second half of the tail, which is black, while the tan covers the upper part of the tail. The other top parts of the figure (back, neck, upper jaw, part of the sail) reverse this paint scheme and are black instead. This black colouring ends in bent triangular stripes over the figure's flanks. The sail is festively adorned with white and orange stripes: additional orange highlights are found on the creature's head around the eyes and nostrils, while the lower part of the eye sockets is white, with small yellow eyes. A black stripe runs around the lower jaw from one side of the jaw to the other, while the Spinosaurus has white teeth and the inside of its mouth is dark pink. A black JP III logo is found on its right upper leg. Its claws on both hands and feet are not painted. The Velociraptor stands in a stalking pose, its right arm and leg stretched outward and its head raised upwards with its mouth open, as if it means to jump onto something. The tail is raised upwards and bent at the tip. Most of this figure is coloured bright yellow, while its back, most of its head, the larger part of the upper tail section and the claws on its feet are painted black. The claws on its hands remain unpainted though. A yellow stripe runs on each side of its face, while blue stripes run around the jaws. Its throat is also coloured blue. A series of six white spots runs over its back. The eye sockets are white, with fairly large orange eyes and cat like black pupils. The inside of its mouth is simply painted black but has white teeth, while a black JP III logo is located on its left upper leg. Analysis: Hasbro's fascinating take on camouflage paint jobs continues in this 'desert' themed 2-pack. It must be said, the previously fairly dull coloured Spinosaurus steals the show in this pack and looks remarkably good. Its intricate zebra or tiger like paint job makes an excellent addition to the CamoXtreme line. This little Spinosaurus might very well disappear in savannah grass (which is not the same thing as a desert environment though): it would have to be pretty tall grass to hide an adult Spinosaurus though, which is probably why the unreleased adult Desert Spinosaurus of this line featured a totally different paint job. At least it would work on a juvenile, though this Spino figure, despite its size, has too many adult features to ever have worked as a baby figure. Despite its inventive new paint job, Hasbro got lazy and ignored the claws, but that's a small oversight considering the paint scheme is still highly attractive. The Raptor has a less successful paint job, though still much more original than its predecessor. Compared to the Spinosaurus it looks rather boring. At least it has painted claws on its feet, though the claws on its hands also were left unattended. Like the Spinosaurus, its paint job would work well in a dry grassy setting - which isn't a hallmark of most deserts: this 2-pack could have used a different name - but the blue colouring around its mouth might give it away. The way this blue is used looks silly anyway, like the Raptor had something with blue blood for dessert (get it?) and forgot to wipe its jaws clean. Also, the inside of its mouth definitely needed more work. Aside from the paint jobs, there is little else to warrant attention to this pack. Both figures are nothing new and have zero playability options. The Spinosaurus is still a decently realistic miniature figure while the Raptor is about adequate but not particularly attractive. 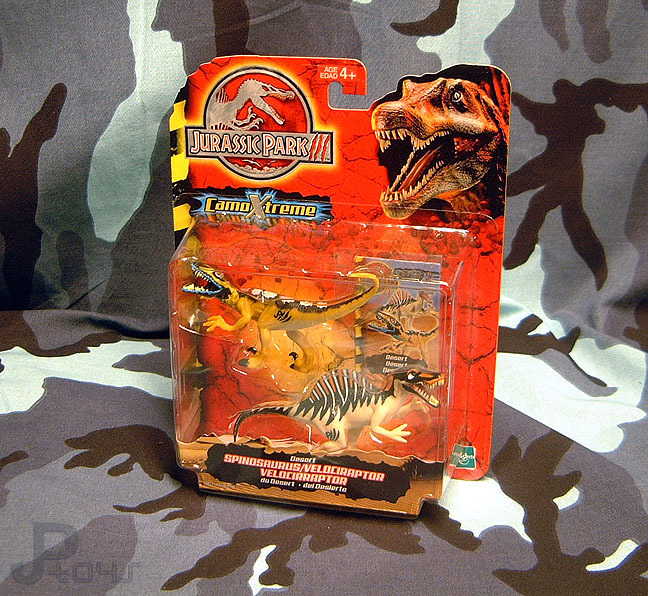 It must be noted, as it was above, that Hasbro planned to release a larger Desert Spinosaurus (which was a repaint of the JP III Wave II Aqua Attack Spinosaurus) for the CamoXtreme line, but it got scrapped. A single specimen appeared and got people speculating quite a bit, so when you read or hear something about a rare and valuable Desert Spinosaurus, it usually concerns that figure instead of this not so rare smaller Desert Spinosaurus, even though this one has a better paint job - by far. Repaint: yes. Both figures were originally featured in the JP III toy line. The Spinosaurus came with Amanda Kirby in Wave I of that line, while the Velociraptor teamed up with Alan Grant, also for Wave I. Both dinosaur figures would be repainted several times again for JP Dinosaurs 2/3 and JP 2009. Overall rating: 7/10. One excellent paint job, one decent enough, plus a nice collector's card are the only interesting things in this set, unless you don't own the original JP III sculpts yet. The CamoXtreme 2-packs are a bit harder to find than most other Hasbro JP dinosaur 2-packs, but not (yet) excessively so. You can still find them irregularly on eBay for a fair price. These 2-packs were imported in the Benelux in decent quantities, making them also fairly easy to find there.